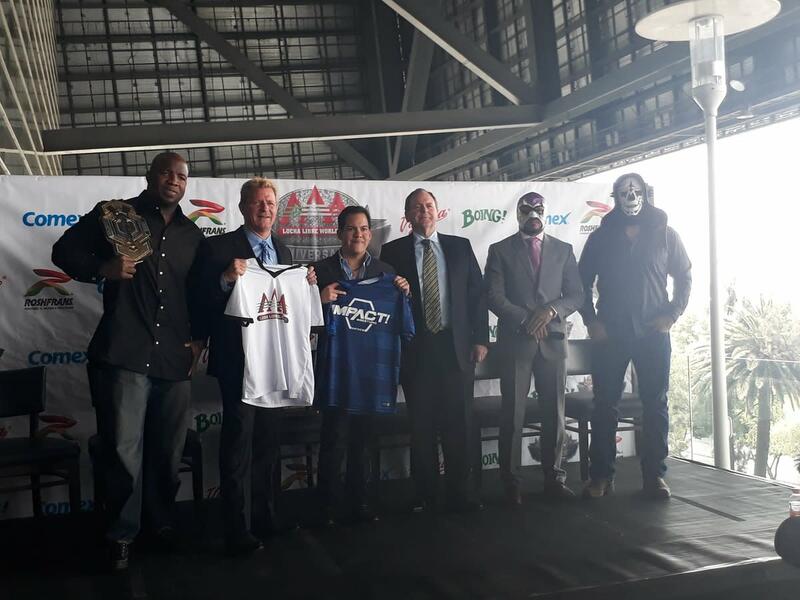 Officials from both Impact Wrestling and AAA detailed how the promotions plan to collaborate in the future at a press conference in Mexico today. It was announced that they would be exchanging talent, with wrestlers from AAA working Impact's Slammiversary pay-per-view on July 2nd and wrestlers from Impact working Triplemania XXV on August 26th. Bobby Lashley, Eddie Edwards, Davey Richards, and Moose have been confirmed for Triplemania. Jeff Jarrett said at the press conference that the AAA wrestlers appearing at Slammiversary haven't been decided on yet. One of Impact's titles will also be defended at Triplemania. The promotions revealed in a press release that they plan to run "co-branded live tours" in the fall as well. Impact and AAA officially announced their working agreement at Rey de Reyes in Monterrey last month. Since Anthem Sports & Entertainment took over the company, Impact has struck a deal to partner with ITV on the World of Sport revival in the UK, announced an alliance with Pro Wrestling NOAH in Japan, and also began a working relationship with The Crash (which is a rival promotion to AAA) in Mexico.